Yesterday I Used Apple Pay at Rite Aid. Today I was Denied. The top entry is my denied transaction this afternoon. I’ve been as excited about Apple Pay as the next guy. I’m also keenly aware that it doesn’t work everywhere. And when you live in a small city like Grand Junction, CO, your options are especially limited. That’s why I was so excited last night, when, on a whim, I tried to use Apple Pay at the Rite Aid down the street and it worked! I honestly didn’t know whether the scanner would even activate, but it did. And then it showed my payment was approved. It was my second purchase with the brand new payment system and I was thrilled. Today, Allison asked me to pick up a few things on my way home from the office, and I’m a major nerd, so naturally I was all too happy to oblige. I was equally disappointed, then, when my transaction was declined with a message on the terminal informing me that Apple Pay was not supported. The terminal mentioned Apple Pay by name. So the system is smart enough to know about Apple Pay and to decide not to take it. 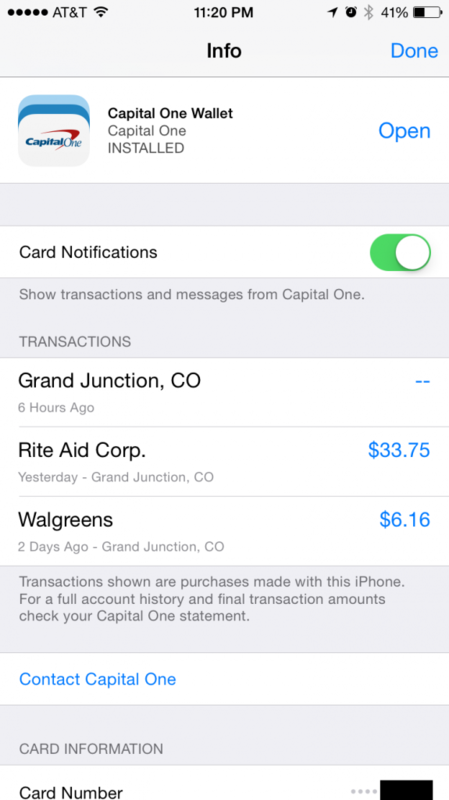 Last night, Apple Pay worked at Rite Aid. Today it did not work. Same Rite Aid, same lane, same terminal. The system specifically knew I tried to use Apple Pay. When the cashier realized what I had done, she kindly informed me that Apple Pay isn’t supported at Rite Aid—that the store had received an email just today to that effect. When I mentioned that I had paid successfully the night before, she just laughed and—I wish I could remember exactly what she said—basically indicated that she wasn’t surprised at all. Under any other circumstances I would have written this off as merely an inconvenience, nothing more. But because of the it-worked-and-then-it-didn’t nature of my experience, I can only draw one conclusion: Rite Aid (and maybe other retailers) are intentionally crippling their payment system to prevent people from using Apple Pay. Naturally, I can’t know the motivations for such a decision. I can’t know them. But I can guess. And lest you believe it’s because Apple Pay costs Rite Aid any cold, hard cash, Apple takes a 0.15% fee only from the bank. Retailers pay no fees for accepting Apple Pay that they wouldn’t pay for a normal credit card transaction. There’s no actual cost to Rite Aid, there is only opportunity cost. They (and certainly other retailers) stand to profit from the use of MCX payments starting next year, and MCX will naturally do better in an environment where a better, easier1 way to pay doesn’t exist. Fundamentally, it’s little more than an inconvenience. I happily used my debit card last week, it’s not that much more trouble to use it now. It’s not that I’ve tasted Apple Pay and don’t want to go back (though I don’t). Nor am I whining because I can’t use my beloved Apple product anywhere I want. That’s fine. I look forward to the day when I can use Apple Pay everywhere in the world, and my Google-loving friends can pay with their Android phone at all of the same places. But is my life any worse today than it was yesterday? Of course not. What gets me is that Rite Aid are—knowingly, unnecessarily, and at the expense of their customers—crippling their own systems in a way that is nothing but harmful to consumers. Update, Oct 23 at 11:30 MDT: It appears this affects Google Wallet transactions too. @Futment @riteaid system IS compatible. @riteaid blocked it and Google Wallet today. Both worked yesterday. Bad business decision.